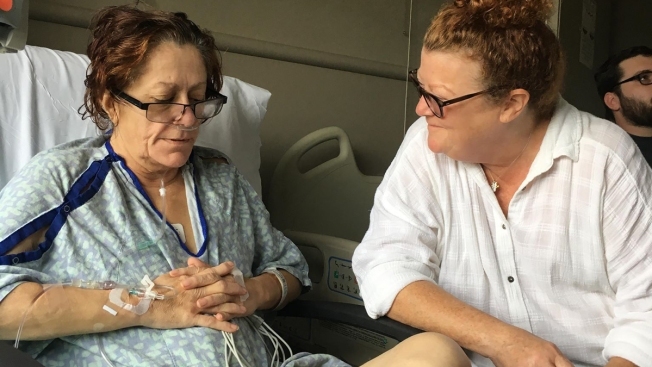 Michele De Leeuw recovers in the hospital, with her friend by her side. Moments after a Michigan man made the heart-wrenching decision to take his wife off life support, she started breathing on her own. Michele De Leeuw, 57, was rendered nearly brain dead by a heart attack in August while at home with her husband. Days later, one of her doctors told her husband, Karl De Leeuw, that, "the woman that you know as your wife is not there anymore," he said. Less than four months later, she's made an almost full recovery, NBC News reported. On Tuesday, the Sterling Heights Fire Department awarded her its "Survival Coin" at an event for heart attack survivors and the first responders who treated them.